Striking CCTA bus drivers man a picket line on Church Street this afternoon. They say they plan to maintain the protest every day until they agree on a new contract. Striking bus drivers are preparing a counter-offer for Chittenden County Transportation Authority management that could be ready as soon as Wednesday, a union spokesman said Tuesday. In an interview, bus driver Rob Slingerland said officials from the Teamsters Local 57 union are putting the finishing touches on a proposed contract and are hoping to soon meet with CCTA to try and resolve the strike, which is now in its second day. 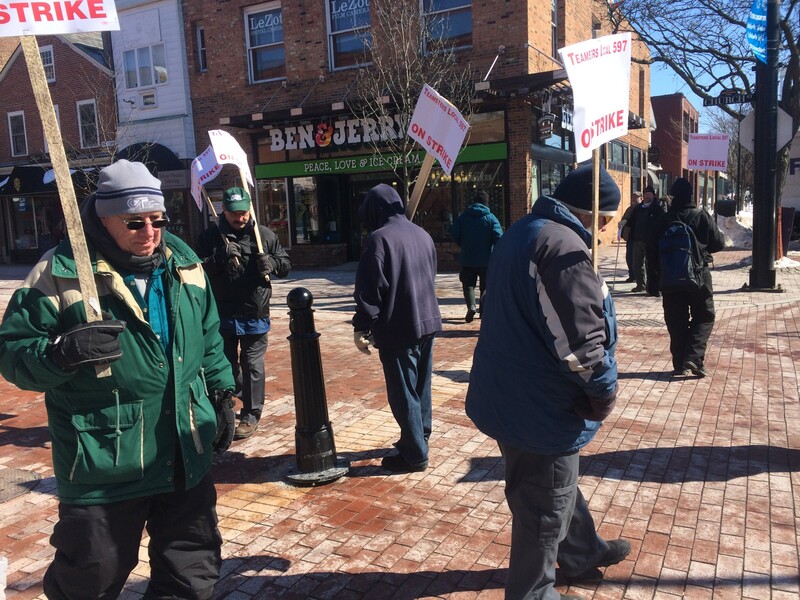 Slingerland made his comments while taking a brief break from a picket line at the intersection of Church and Cherry Streets that he says drivers plan to maintain every day until a deal is reached. While around 50 drivers manned the line at times Monday, Slingerland said drivers will be taking shifts in the coming days — Eight drivers were present early this afternoon. The union unanimously rejected CCTA's most recent contact offer last week, prompting the strike. CCTA has released statements saying the union is obligated to make a new offer. The union has rejected a request to settle the matter in legally binding arbitration. CCTA General Manager Bill Watterson said the agency is willing to sit down with the union and restart negotiations if the drivers' proposal includes some compromise. "The dilemma is, all I'm hearing is rumor," Watterson said. "If something is brought to us, of course we would look at it. A legitimate proposal would be one that offers some amount of compromise toward the other side, an olive branch. If it's restating their old position, it would not be a serious proposal." While there are currently no negotiating sessions scheduled, Watterson said it "can be a fairly expedient process," and occur within a few days. Meanwhile, as the region continues to grapple with loss of a transit system that provides roughly 10,000 rides a day, concern is growing for scores of residents who don't have a car. Perhaps nowhere is the need for reliable transportation more acute than at the HowardCenter, where many patients rely on CCTA buses to ferry them to treatment appointments for substance abuse and mental health problems. Bob Bick, director of mental health and substance abuse services, said the HowardCenter yesterday saw a spike in the number of no-shows and cancelled appointments for both counseling and sessions in which opiate addicts receive methadone or other drugs designed to wean them from their addiction. Bick stressed that the connection between the strike and the missed appointments was "correlation, not causation," but said he believed the CCTA shutdown was the likely culprit. "The number of no-shows was atypical," Bick said. "In this line of work no-shows are fairly common because of the ability of clients to manage their lives is often challenging for them. But we saw an uptick yesterday." The HowardCenter has sent some addicts home with multiple days of medication, but that is only a temporary solution that can be allowed for the most stable patients, Bick said. Patients receive needed counseling and support when they arrive in person for medication, Bick said, and counselors are wary of not seeing them face-to-face for more than a few days. "Clients and patients establish relationships with counselors and physicians, so it's not like you can pick up and go somewhere else," Bick said. The HowardCenter is also worried about its budget if the strike lingers. "If we have nothing to bill, we have no revenue," Bick said. Slingerland said drivers have long been worried about how their neediest riders would cope with a strike.